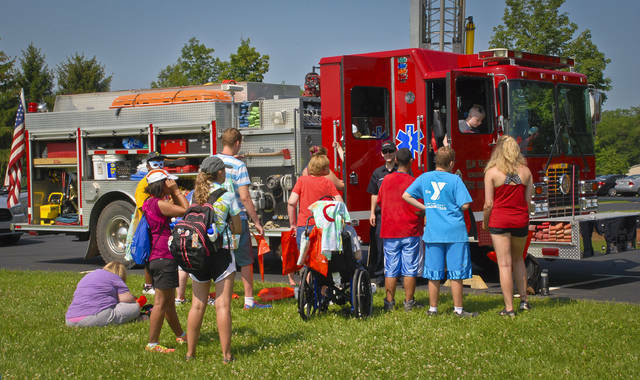 Hot summer temperatures couldn’t melt the smiles of the superheroes buzzing around Wednesday at Recreation Unlimited’s Safety Day. Many of the campers were into the spirit of the day’s Superhero theme dressed as their favorite superhero. 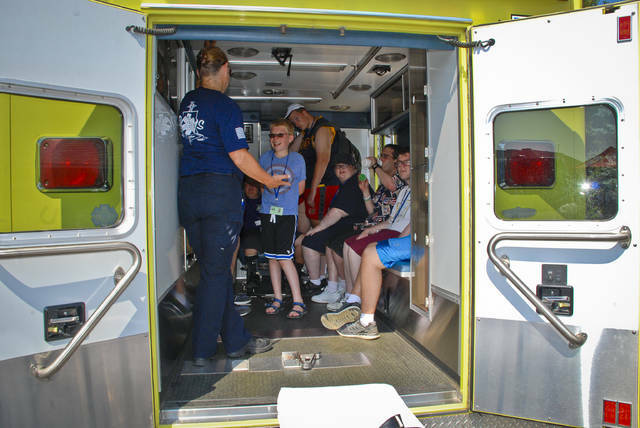 The annual event brings together first responders and equipment for the special needs campers to see and touch first hand. Huttlin said the camp usually tries to schedule Safety Day during youth week at the camp. Huttlin said by bringing the campers over in waves gives them a little more individual time with the different first responders. He said the heat makes everything a little harder but his advice for hot days makes the event enjoyable and possible. Huttlin said the current campus, near Ashley, has been in existence since 1989. Huttlin said the facility is one of the few that serves youth and adults. Bob Lavender, Operations Manager for the Delaware County Emergency Management Agency, said he has been organizing the event for the past 15 years. He said he’s the person that gets the first responders and equipment together for the event every year. Sandy Mackey, Administration Manager for the Delaware County Emergency Management Agency, said by pulling all the first responders together it lets special needs people see and talk with the people that might come to their house during an emergency. She said it helps them understand and not be afraid. Recreation Unlimited currently serves approximately 3,700 individuals with disabilities and health concerns from 57 counties in Ohio. The facility is the largest provider in the state serving special needs individuals in sports, recreation and education. This entry was tagged delaware county, Huttlin, Recreation Unlimited. Bookmark the permalink.